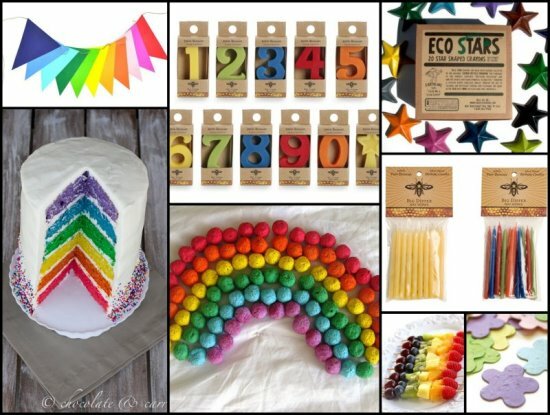 Green is our favorite color at EcoPartyTime but your baby, soon to be toddler, deserves all of the colors of the rainbow when you celebrate that first milestone birthday. 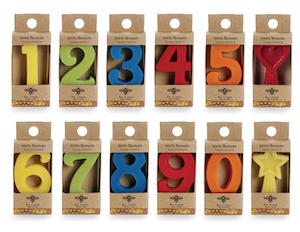 String Watercolours EcoGarlands with all of the colors of the rainbow around your party space. If you hold your party outdoors, string the garlands around the trees (over time they will naturally decay from nature if you donÕt recycle them) to make an exciting play space for little ones. If you have time and sewing skills, you can turn old clothing into your own colorful garland. Cut and sew strips of fabric to create a rainbow table cover. Remind your guests the reason for your celebration by hanging colorful Happy Birthday Felt Banners that can be reused for many future birthday celebrations. There's no need to use disposable tableware. Colorful mis-matched plates will cheerfully add to the rainbow theme and be more environmentally friendly. Create a centerpiece of cupcakes that have been frosted in all the colors of the rainbow. Place a Big Dipper Waxworks Birthday Number 1 Cake Candle in each one and light them before singing the birthday song for a glowing tribute to the guest of honor. These beeswax candles are made from a natural process that uses no chemicals and very little energy, supporting the sustainable industry of beekeeping. If your baby has older sisters, dress them in lovely Sarah Silk Pink Princess Dresses so that they can share in baby's special day. 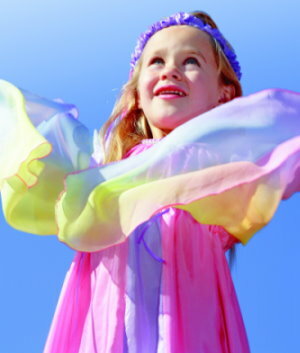 Give all the little girls at your party rainbow Sarah Silk Fairy Wings or Sarah Silk Garlands to be living expressions of the party theme. 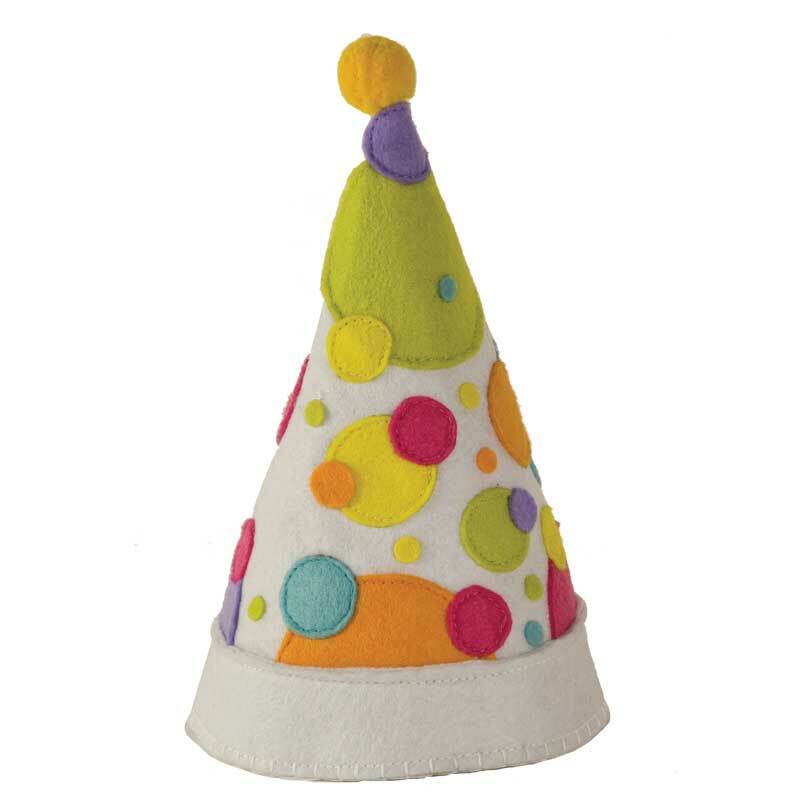 When the children arrive at your party, give each a Polka Dot Felt Party Hat, reminding them it's time for the party to begin. Sketch the outline of a rainbow on a large piece of poster board. Give the children non-toxic Crazy Crayon Sticks that are made from 100% recycled materials, and set them loose to fill in the colors of the rainbow. On a sunny day, bring the children outside to blow bubbles and show them the rainbows on the bubbles. 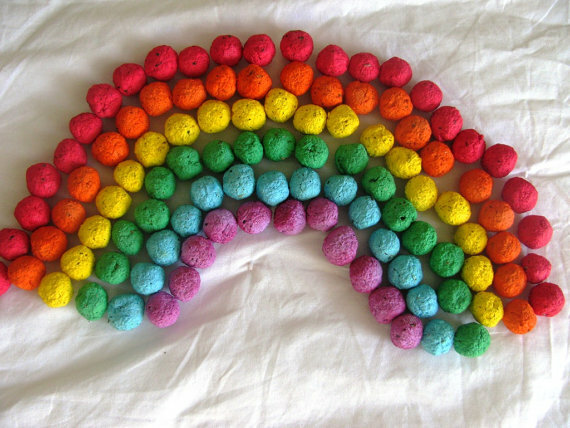 Lead the children in a round of a rainbow song. 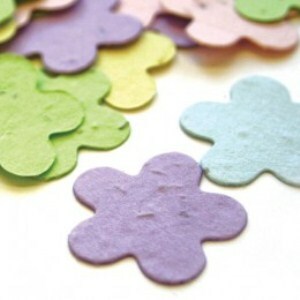 Give each child a colorful felt Cupcake Goodie Bag filled with edible treats such as these giant, organic, personalized 1st Birthday Cookie Favors. The goodie bags will be reusable while the treats will disappear leaving no waste behind! 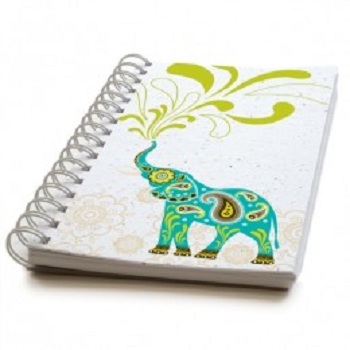 Or fill the bags with Elephant Plantable Notebooks and Recycled Crayons so they can continue the rainbow fun at home. Serve pink lemonade from a clear dispenser or punch bowl. Give guests reusable cups or glasses. No need to use wasteful, single serving juice boxes or paper cups. 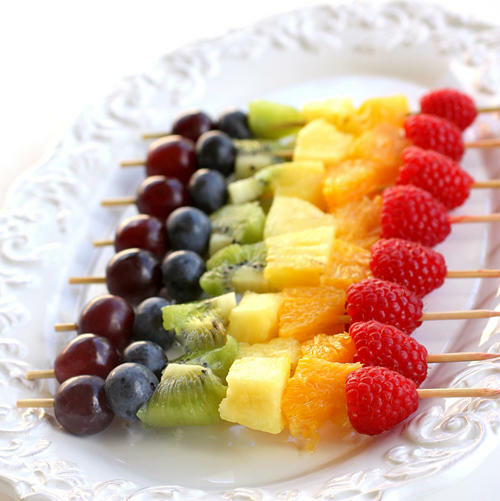 Design a rainbow theme fruit platter by cutting up and arranging the following fruit in rainbow color order: strawberries, oranges, mangoes, kiwis, blueberries, blackberries, purple grapes. Bake or purchase a rainbow themed birthday cake. You can do this one of two ways. Either frost your cake with white frosting and decorate with a rainbow design by tinting portions of frosting with natural food coloring derived from vegetable and fruit extracts. 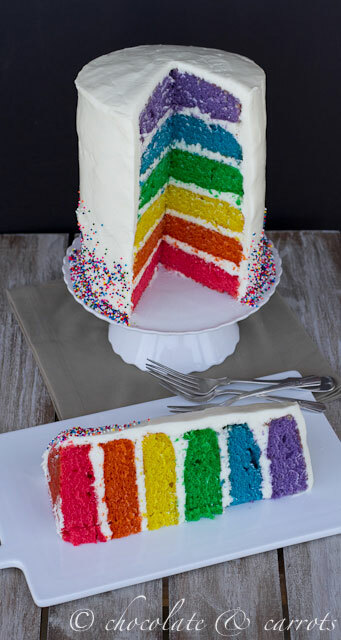 Or make a rainbow cake by tinting seven different thin sheets of cake a different color of the rainbow. Stack them in proper rainbow order with a thin layer of white frosting in-between layers and a cheerful frosting color on the outside.